Bocce Terms - Be in the know, speak the language! Advantage - The team throwing the pallino is said to have "pallino advantage" because they get to place the pallino where they want it on the court and have a clear shot to place the first bocce ball. Backboards - The shorter court walls at each end of the court. Sometimes called endboards or backwalls. Banking - Throwing the bocce ball such that it hits and bounces off the sideboards towards the pallino. Bocce Balls – Eight balls about 4 1/4 inches (107 millimeters) in diameter and weighing approximately 2 pounds that are rolled toward the pallino to score points. The balls are of 2 distinct colors, 4 each color. Captain - The person on a team designated to coach and make all team decisions during a game. Centerline- The line at the half way point between the two back walls. Coin-toss - The initial flip of a coin at the start of a game to determine which team throws the pallino the first time and chooses the color of the team's bocce balls. Court - The rectangular playing area defined by a backboard at each end and two sideboards with a level and smooth playing surface. Court Bocce - A sport played on a standard court consisting of a rectangular playing area defined by a backboard at each end and two sideboards with a level and smooth playing surface. Dead Ball - A dead ball is a bocce ball removed from play during a frame for reasons defined in the game rules. End Captain - The person designated by the captain to coach and make team decisions at their end of the court. Fault line- A player must release the bocce ball and pallino before completely crossing this line. A player may step on but not over this line. Footwear - Shoes with smooth soles, like sneakers, that will not damage the clay playing surface. Foul - An act committed by a thrower that violates the game rules. A team/player is penalized as specified in the rules for committing a foul. Forfeit - The action taken against a team that does not have at least 2 players to start a game at the designated start time or refuses to complete a game for any reason. Frame - The playing of all the bocce balls in one direction and the awarding of points. After points are awarded a new frame starts in the opposite direction. Frames are played until sufficient points are accumulated to win the game. A frame is sometimes called a Giro. Game- A contest decided on a team gaining 12 points. Winning two games claims a match. Red or Green Go - Direction given by the referee to the team designated to throw the next ball. Half Court Marker – A line marked on the sideboards/court surface exactly halfway between the two backboards. Hitting or Spock - A declared underhand bowling type hard throw directly at the balls on the court to purposely hit and move an opponent's ball or the pallino. Sometimes called spocking, shooting, bombing, or raffa. Hitting Foul Line – The second foul line marked on the sideboards/court surface 10 feet from each backboard behind which the bocce balls thrown hard to hit and move other bocce balls or the pallino must be released. This allows for a running delivery to gain momentum on the ball. Sometimes called the spocking, shooting, bombing, or raffa foul line. Holding - The team whose bocce ball is closest to the pallino. Illegal Movement - A legally thrown ball is moved from its resting position by a player or referee. In-bound Lines - Lines marked on the sideboards/backboards/court surface to define the 12 inch boundary for the initial pallino throw. In Team - The team who has the closest bocce ball to the pallino. Red or Green In - Information given by the referee to the players as to which team has the "In" ball. Interference - A legally thrown ball is interfered with while moving by someone or something not on the playing surface before the throw. Jack - The pallino is sometimes referred to as the "Jack". Kiss - A term that describes the condition where the bocce ball is touching the pallino. Sometimes called Baci. League - A league is a group of bocce teams playing a prescribed number of matches or games over a set period of time with records kept to determine a winning team. Live Ball - A live ball is a bocce ball legally in play on the surface of the court. Match- Two teams competing in three games. Measure - The act of measuring the distance between the pallino and the bocce balls to determine which team's bocce balls are the closest to the pallino. No Point or Tie - This is when the closest ball of both teams are equidistant from the pallino. The team delivering the last ball must throw again or if all balls have been played no points are awarded for that frame. Opponents - The two teams on the court who are competing against each other. Out Team - The team who does not have the closest bocce ball to the pallino. Pallino – A small ball used as a target ball for throwing the bocce balls. Sometimes referred to as "object ball", "jack", "pill", "cue ball", "bullet", or "pallina". Penalty - Action taken against a team or player for violating game rules. 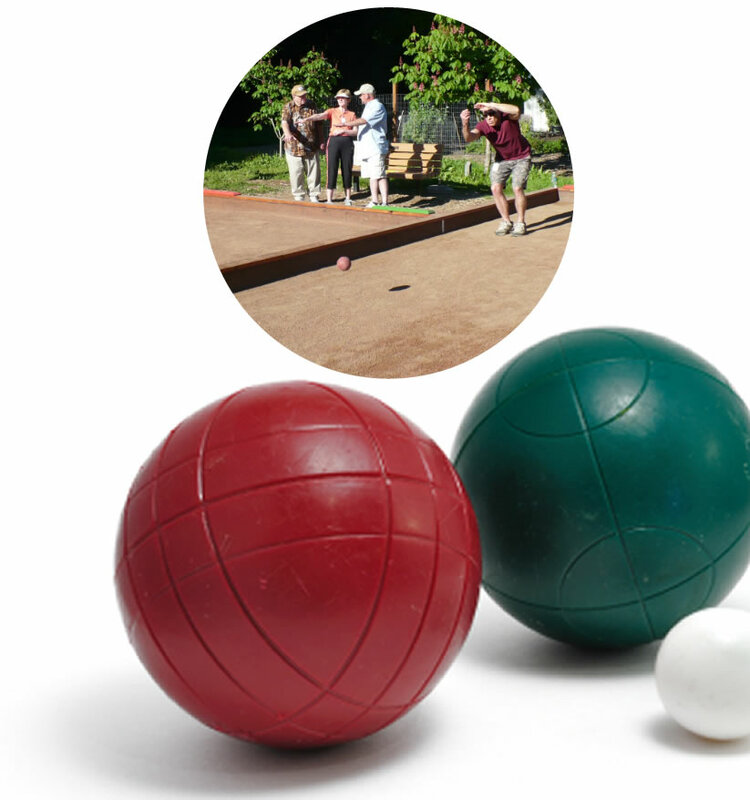 Pointing - The underhand throwing action of a player to roll the bocce ball as close to the pallino as possible to score points. Throwing styles vary from player to player. Pointing is sometimes called punto or puntata. Pointing Foul Line - The first foul line marked on the sideboards/court surface 6 feet from each backboard behind which the pallino and bocce balls rolled for point must be released. Sometimes called the throwing, pitch, punto, or puntata foul line. Referee - An independent official that enforces all game rules, directs play, determines the "in team", makes measurements, and determines team points for each frame. Rolling - Rolling the bocce ball on the court surface with the intention of getting close to the Pallino. Scoreboard - Numbers 1 through 12 arranged similar to a clock face with an arrow pointing to the score for the red or green team. The scoreboard can be a single set of numbers with a red and green arrow or a separate set of numbers for each color. Shooting - Propelling the bocce ball with the intention of moving the opponent's bocce or the Pallino. Sideboards - The longer court walls parallel to the direction of throwing. Social Bocce - Social Bocce is basically a group of people getting together and forming temporary teams for the day to play the game but not in a scheduled league or tournament play. Substitute - Extra players on the team or on the league roster that replace a regular player. Team - A team on the court has 4 players maximum and 2 players minimum with each player throwing 2 balls. A team may have one or more substitute (alternate) players on the team. Tournament - A tournament is a group of bocce teams playing matches or games over a set period of time with losing teams being eliminated until a single winning team remains. Volo - A high arcing throw of a bocce ball in the air beyond the center line of the court. Volo shooting in Court Bocce is not permitted because of safety considerations and to prevent damage to the courts.